Part II: In Memoriam Albert Neuberger. List of Contributors. Other volumes in the series. Chapter 1. Proteoglycans: a special class of glycoproteins (J.E. Silbert, M. Bernfield, R. Kokenyesi). Chapter 2. Nuclear and cytoplasmic glycoproteins (K.D. Greis, G.W. Hart). Chapter 3. Crabohydrate units of nervous tissue glycoproteins (J. Finne). Chapter 4. Glycosyl-phosphatidylinositol anchors: structure, biosynthesis and function (R.N. Cole, G.W. Hart). Chapter 5. Dictyostelium discoideum glycoproteins: using a model system for organismic glycobiology (H.H. Freeze). Chapter 6. Hemocyanins (J.P. Kamerling, J.F.G. Vliegenthart). Chapter 7. Fish glycoproteins (S. Inoue, Y. Inoue). Chapter 8. Amphibian glycoproteins (G. Strecker). Chapter 9. Blood glycoproteins (K.J. Clemetson). Chapter 10. Transferrin superfamily. An outstanding model for studying biochemical evolution (J. Montreuil, G Spik, J. Mazurier). Chapter 11. Chemistry, biochemistry and biology of sialic acids (R. Schauer, J.P. Kamerling). Chapter 12. Plant lectins: tools for the study of complex carbohydrates (I.J. Goldstein, H.C. Winter, R.D. Poretz). Chapter 13. Microbial lectins and their glycoprotein receptors (N. Sharon, H. Lis). Chapter 14. Adhesive glycoproteins and receptors (R.C. Hughes). Chapter 15. Carbohydrate differentiation antigens Ii, SSEA-1 (Lex) and related structures. Prototype mammalian carbohydrate antigens that serve as ligands in molecular recognition (T. Feizi). Chapter 16. Cell adhesion and recognition mechanisms in the nervous tissue (J-P. Zanetta). Chapter 17. Neoglycoproteins (R.T. Lee, Y.C. Lee). 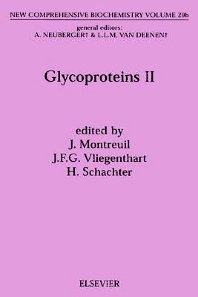 Part II of this excellent work covers proteoglycans and mucins and deals with many more examples of glycoprotein function. It also covers glycoproteins from four more species (slime mold, snails, fish, batracians). The content of the volume is very comprehensive in that most contributors are focussed on discussing, in depth, the wealth of most recent advances in their field, referring to previous reviews of older work for background information. This method effectively produces a very wide subject coverage in a smaller number of chapters/volumes.